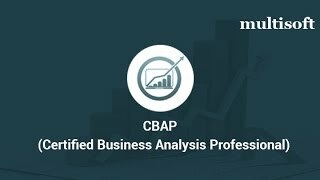 CBAP® (Certified Business Analysis Professional) training & certification is ideal for professionals with in-depth experience in business analysis. This program offers proficiency in understanding business requirements and recommending likewise solutions that bring maximum returns. This CBAP® online training by Multisoft Virtual Academy is based on the latest version of BABOK® Guide i.e. BABOK® Guide V3.0 provides deep understanding about internationally-accepted principles and standards of business analysis, in addition to practical knowledge of business concepts that are helpful on-the-job. CBAP® certification is valuable as more and more organizations are recognizing this credential and looking for individuals with business analysis experience. After attending online CBAP® online training with Multisoft Virtual Academy, you will earn 35 PD Hours that make you eligible for undertaking the CBAP® certification exam. *Multisoft Virtual Academy is a division of Multisoft Systems. What are CCBA®/ CBAP® certifications? CCBA® (Certification of Competency in Business Analysis) and CBAP® (Certified Business Analyst Professional) are the credentials awarded by IIBA® (International Institute of Business Analysis) to those professionals who have considerable amount of expertise in the profession of Business Analysis. Both the credentials are coveted ones and promise high level of recognition at work place along with considerable amount of increase in payscale. CCBA® requires 3750 hours of Business Analysis experience while CBAP® requires 7500 hours of Business Analysis experience. What are the prerequisites for CCBA®/ CBAP® certifications? Recertification After 3 years need CDUs for recertification but the number is unknown. Requires 60 CDUs for recertification after every 3 years. You can also watch the detailed video for more details. Do I need experience in all the Knowledge Areas before taking then exam for CCBA®/ CBAP® Certification? No, CCBA® requires you to have minimum 900 hours in two of the six knowledge areas or 500 hours in four of the six knowledge areas while in case of CBAP®, you require minimum 900 hours in four of the six knowledge areas. How do I meet the 7500 or 3570 hours of Business Analysis Experience in CCBA®/ CBAP®? Ideally a candidate is required to have spent 3570 or 7500 hours spent on Business Analysis activities (not just working hours). IIBA® has online application which requires each detail about the project and your role within that project to be filled in. Try to be as accurate as you can since IIBA® audits some of the forms annually and the candidate has to present the proofs at that time. What criteria does IIBA® follow to validate Business Analysis experience of a CBAP® aspirant? For the CBAP® certification, IIBA® considers work experience related to business analysis tasks. The tasks must fall in line with those covered in A Guide to the Business Analysis Body of Knowledge® (BABOK® Guide). Usually referred to as the BIBLE for CBAP®/ CCBA® aspirants, it is a must read for the candidates. The first and foremost step in the certification journey starts with understanding the principles of BABOK®. Which version of BABOK® would be more suited for me V2 or V3? IIBA has announced that the current version of BABOK Guide i.e. V2 is going to be down on 22nd September 2016. As a result, the ongoing CCBA® and CBAP® exams that are aligned to BABOK® Guide V2 will only be available up to and including September 22, 2016. From 30 September, 2016, the new version of BABOK® Guide i.e. V3 will be implemented. Check out why TOP REASONS TO GO FOR CBAP® before BABOK® v2 Exam Retires! What is the procedure of registering for the CCBA® and CBAP® Examination? Once you meet all the prerequisites, you are all set for your examination. IIBA® determines your eligibility to sit for the exams depending upon the qualifications and details you have mentioned in the application form. You will receive an email from IIBA® with instructions in case your application is accepted. You simply have to reserve a date for the examination with the official testing agency. You can save money by applying for IIBA® membership. The cost of membership is $95/year. Note: Do visit the website www.iiba.org for any doubts on the cost. Is studying BABOK® enough to clear the certification exam? BABOK® is definitely the most important resource when it comes to preparing for CCBA®/ CBAP® credentials. But in order to aid your preparation and get the desired results, you need to enroll for formal Training sessions which will provide the rest of materials and skill building. Multisoft CBAP® Online Preparatory Workshop is the ideal one which is designed in synchronization with BABOK® and is aimed towards making your certification path easier. What is the pattern of CBAP® exam? The CBAP® exam consists of a total of 150 questions in multiple-choice format. Primarily based on the BABOK® guide, the total time available to complete the examination is 3.5 hours. Multisoft training deliverables include the certification mock tests which are the simulation of the actual CBAP® exam. Attempting these tests can help you to prepare for the exam. Write in to us at info@multisoftvirtualacademy.com or fill in this form to get a free access to a CBAP® mock test. Where can we get the formal training sessions for CCBA®/ CBAP®? Are they in line with IIBA® guidelines? IIBA® does not provide any formal training, but it entitles EEPs (Endorsed Education Providers) like Multisoft Virtual Academy to conduct trainings that contribute towards the required Professional Development (PD Hours). Also you can contact your local IIBA® chapter for BABOK® study groups. What are the career benefits of CCBA®/ CBAP®? The certification provides an opportunity to the professionals to get into the elite group of Business Analysts. Apart from earning professional recognition, the certificate promises salary growth. More and more organizations have started identifying the certified CBAP®/ CCBA®s and are even paying a premium for their services. What is the ideal way to prepare for the CBAP® certification exam? Ideally a candidate is recommended to prepare for three to four months for the certification exams. Multisoft Virtual Academy is a name which has evolved to be a seasoned and most trusted partner for CBAP®s in their certification journey. The online preparatory workshop goes a long way in enhancing the knowledge areas and providing the appropriate guidance. Check out Tips to Ace CBAP® Exam for better results. Where can I access a formal class to prepare for the CBAP® exams? Multisoft Virtual Academy provides Online Training to the CBAP® aspirants. The program provides understanding about the business requirements and the concepts of BABOK® in detail. Multisoft is an Endorsed Education Provider (EEP) and the resources provides go a long way in creating superior business analysis skills. What is the official status of the institute? The institute is an IIBA® Endorsed Education Provider (EEP) and the resources provided goes long way in creating a superior knowledge building. How do I get recertified in CBAP®? CCBA®/ CBAP® require you to meet certain continuing proficiency requirements in order to maintain your certification after 3 every three years. This is basically done to create an atmosphere of giving back to profession and to encourage the professional development of the recipients. Once you get certified based on the current version aligned to BABOK® Guide v2.0, the next date of recertification will be after the cutover to the new exams on Sept 30. This means, there will be a 3 year cycle before you sit for the recertification exam. Suppose you got certified for the CCBA® or CBAP® exam before September 30, 2016. Now, for the recertification exam you have 3 years cycle by your side. This means, up to Sept 30, 2019, you can go for the recertification exam. Where can I access the sample assessments or attempt Mock Tests for CCBA®/ CBAP® and how can they help me? Sample Assessments and CBAP® mock tests are quite helpful to be acquainted with the type of questions you are going to attempt in CBAP® examination. Probably you have a fair chance of nailing it in first chance then. Multisoft provides you a bank of mock tests and module wise assessments to develop your understanding about the real exam. Become exam ready with Online Training. Take a sample assessment or request a mock test here. Is CBAP® the only Business Analytics course offered by Multisoft Virtual Academy? Business Analytics is a highly propitious stream and is deemed to be of great earning potential. Apart from CBAP®, Multisoft has a vetted list of certifications which can positively impact your career. Browse the offerings here. I am new to Business Analysis. Do you have any beginners’ business analysis course? If you are new to Business Analysis and do not hold the relevant experience needed for CBAP®, you can go for CCBA®. Apart from it, you can also browse the different courses being offered by the institute here and can make the decision on the basis of your personal career choice. Will the CBAP® training at Multisoft certify me as well? After the successful completion of the training with the institute, you will receive Training certificate. Also you will earn 35 PD Hours which will make you eligible for undertaking the CBAP® certification exam. Why to choose Multisoft Virtual Academy for CBAP® Exam Preparation? Collaborative Learning Methodology: Get introduced to a Learning mechanism which has foundations in interactive and collaborative pedagogies. 24/7 Learning: Multisoft provides you an access to it Learning Management System that hosts all the CBAP® learning and course material. The access is 24/7. Flexible Schedules: Become the master of your will. Schedule your own batch or join an existing one, take your pick. Practice to Perfection: Gaining expertise through a vast question bank with real time score and time analysis along with detailed explanation of answers. Multisoft is the Endorsed Education Provider (EEP) and is recognized by IIBA® for dissemination of Business Analysis knowledge through its industry focused and quality driven trainings. If you are willing to upgrade your knowledge quotient, Multisoft is there for you. We provide the option of flexible schedules for all the programs. For working professionals, there is an ease of learning through recorded sessions and 27/7 access to learning resources. Who is the instructor for CBAP®/ CCBA® Online Training at Multisoft? Is the instructor certified? Yes, the trainer/instructor is accredited with CBAP® and PMP® certifications. He is a Business Analysis wizard with an experience of 8 years in IT industry. His vast knowledge and understanding of the concepts is complemented with the actual on-job experiences. He is applauded for his noteworthy improvements in the leading MNCs. You can check the details here. The instructors are routinely guided by Multisoft to deliver the best and valuable training to the students. Once you enroll in the program by paying the fees for the same, you get access to LMS. You can access all the course notes, assessments and other material through LMS. The learners get access to the content for 24/7. Does Multisoft provides the Training completion certificate? You can make the online payment for the choice of course you want to undergo. The fee details are mentioned on the website. For making the payment, you can click on ENROLL button which will take you to the payment gateway. You also have the option of bank wire transfer. You can write to us at info@multisoftvirtualacademy.com to get the details. No, the course fee doesn’t include the certification fee. This fee is for the CBAP® Exam Preparatory Workshop only. The candidate has to pay the fee for CBAP® certification at the time of registering for the exam at IIBA® website. It is a third party transaction and has to be done by the candidate only, although Multisoft can provide the necessary assistance in filling up the form for certification exam. Will Multisoft provide me the CBAP® certification? Multisoft provides you the certificate for Training in Business principles needed for CBAP® Certification exam. For obtaining the CBAP® credential, the candidate has to schedule and pass the Certification exam conducted by IIBA®. Apart from providing 35 PD Hours which is a stipulated requirement for CBAP® Certification exam, Multisoft also offers 7 Assessments and 3 Mock tests to test the skills and prepare for the certification exam. If you still have any queries regarding the program or any other details, you can drop a mail at info@multisoftvirtualacademy.com. You will get a reply within 24 hours.